Modern conflict cannot be viewed in a bipolar framework. International relations expert Moeed Yusuf’s new book provides a much-needed alternative. The year 1998 was a landmark one for the South Asian security scenario, for it gave way to a nuclearised India and Pakistan. This changed the dynamics by which countries traded economic, military, and diplomatic blows whenever they were at loggerheads. Plus, their respective nuclear deterrence capabilities made room for the United States to help de-escalate tensions whenever India and Pakistan were at each other’s throats — be it the Kargil War, the 10-month military standoff amidst the ‘Twin Peaks crisis’, or the post-26/11 friction. Literature on crises progression between hostile nuclear states still assumes a bilateral context — one side threatening the other by giving the impression that it will resort to extreme methods, just to get the other party to back down. Such was the nuclear equation during the Cold War. But bipolar frameworks cannot be applied to contemporary conflict backdrops between regional powers; that too, when a third party has made its presence felt during many Indo-Pak clashes. Prolific international relations expert Moeed Yusuf has claimed a state’s foreign policy is not beholden to one bloc, as before 1991. 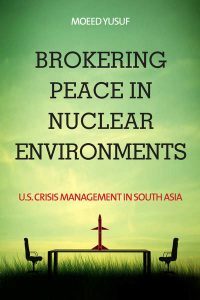 In light of this multi-polar post-Cold War landscape, Yusuf’s new book Brokering Peace in Nuclear Environments: US Crisis Management in South Asia injects a much-needed dose of original thinking into academia and policy circles. Yusuf’s acumen for analysing every stratagem utilised by the three stakeholders is palpable. He deconstructs the following sequential facets of the paradigm (the crisis-triggering event, the ensuing offensive/defensive blows exchange, the third party’s entrance along with how regional rivals cater their strategies accordingly, and de-escalation) and how they played out during Kargil, Twin Peaks, and the 26/11 fallout. The first two make for some compelling case studies, but the analysis of 26/11 aftermaths is a treat for the South Asia security enthusiast. Gaining insight regarding how New Delhi, Islamabad, and Washington drew upon their Kargil and Twin Peaks experiences after a five-year period of relative peace is intriguing. These previous lessons learned add another layer to how the brokered bargaining process played out, especially since there was little military mobilisation compared to the earlier skirmishes. Yusuf methodically unpacks the terminology of the brokered-bargaining model and applies it to the aforementioned crises (and the Iran-Israel/the Korean peninsula/the Sino-Indian milieus). If scholars of nuclear conflict and American policymakers are to grasp how South Asian rivals strategise and outmanoeuvre each other with the United States looming over them, classic explanations in the form of bilateral deterrence might not hold up. By no means does Yusuf call for a paradigm shift, but rather a contextualised lens at specific regions outside of previous conflict management frameworks. Should the US decide to play a further role in mitigating future crises between these two countries, his empirical and theoretical reasoning warrant attention. Some will conclude that the brokered bargaining model is very simplistic and that future crises will not follow similar pattern as the ones analysed in the book. Broader regional and global circumstances, like Trump’s eschewing of Pakistan and his increasingly overt tilt towards India, may call into question the role of the third party. The fact remains that South Asia is still a cauldron of confrontation. India and Pakistan still lack mutual bilateral escalation controls and crisis management protocols, which very much explains the United States’ presence in past crises. 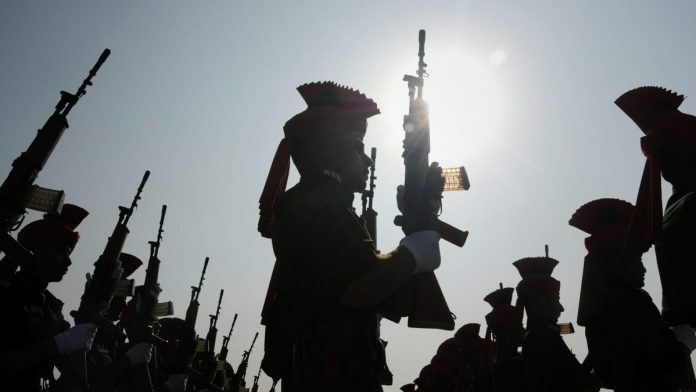 Yes, the third party and Indian restraint were absent from the 2016 surgical strike ordeal, but that might not always be the case in the future. Even if India takes the first step to reigniting fragile peace process and Pakistan takes two as per Imran Khan’s recent victory speech, a small crisis-triggering event is enough of a reason to revisit this model. The book’s content may be very academic in its content, structure, and language, but it does not cater solely to theory-oriented scholars. Journalists and policy wonks looking to get attuned to case-based applications of theory on regional rivals’ and a third superpower’s tactics during tense crises should not miss this one. Those who study Southeast Asia and the Middle East policy will find brokered bargaining relevant too as the author applies his model to those regions as well. After editing seminal works like Pakistan’s Counterterrorism Challenge, Insurgency and Counterinsurgency in South Asia, South Asia 2060, and Getting It Right in Afghanistan, Yusuf’s expertise and sharp analytical insights have long merited a solo-authored book. Stanford University Press was astute enough to bring it to fruition. The author is a public policy graduate from Takshishila Institute and a freelance writer.